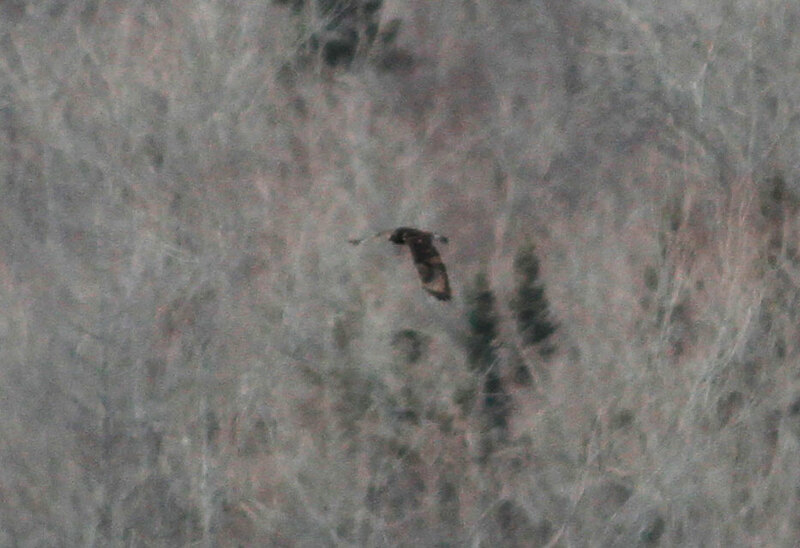 Rough-legged Hawk - dark-morph, Moran WMA, Windsor, Berkshire Co., MA. January 12th, 2015. Yesterday (01/12) I decided to take advantage of a calm morning before the forecast snow storms kicked in in late afternoon. ebird had been sporting images of a dark-morph Rough-legged Hawk in the uplands of Eastern Berkshire County for several days and, seeing as Rough-legged Hawks are like 'hens teeth' in Franklin County I thought it would be fun to try and see it. Two other species had the potential to enliven a morning's birding there; Northern Goshawk and Northern Shrike, the latter being reported almost daily from Moran WMA in Windsor. The drive up through western Franklin County into Berkshire County had a rugged beauty all of its own. On the other hand, being mid-winter, it was exceedingly quiet bird-wise with a flock of 35 Wild Turkeys in Buckland being the only observation of note. Arrival at Moran WMA was virtually birdless aside from a couple of Common Ravens but I ran into a birder who'd just seen a Northern Shrike giving me some room for optimism. The walk into the WMA was icy and bleak with a flyover Red-winged Blackbird (FOY) being of interest but it wasn't until I reached the forested area that things picked up with nice views of Red-breasted Nuthatch and Brown Creeper within a couple of rather large chickadee flocks. Red-breasted Nuthatch - Moran WMA, Windsor, Berkshire Co., MA. January 12th, 2015. 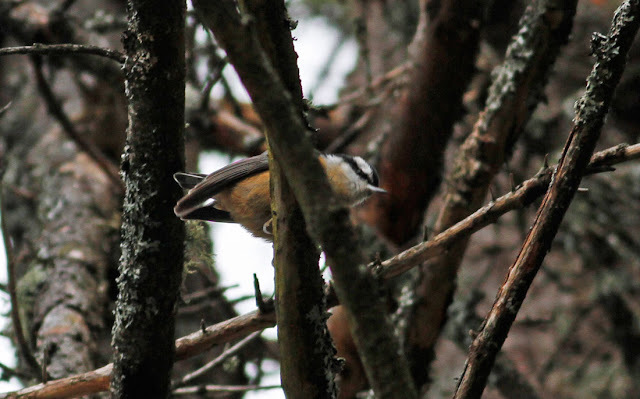 About six of these perky little passerines in the spruce woods. 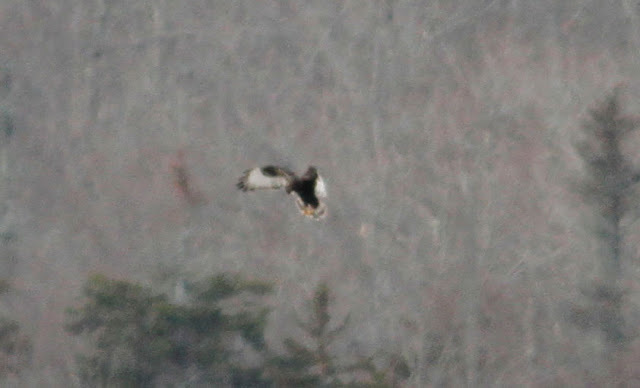 Otherwise seemingly scarce in Western MA this winter. 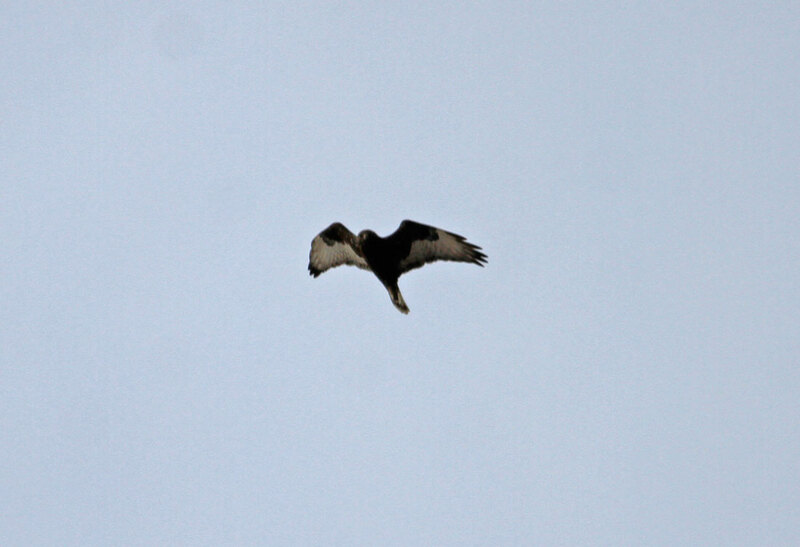 But the raptors proved aloof...very aloof in fact and I was almost back at the parking area before I spotted a dark buteo hovering above a hillside. It looked promising and must surely have been the Rough-legged Hawk but it was just too distant to be sure. Then I decided to stay put in the parking lot and let the beast come to me. 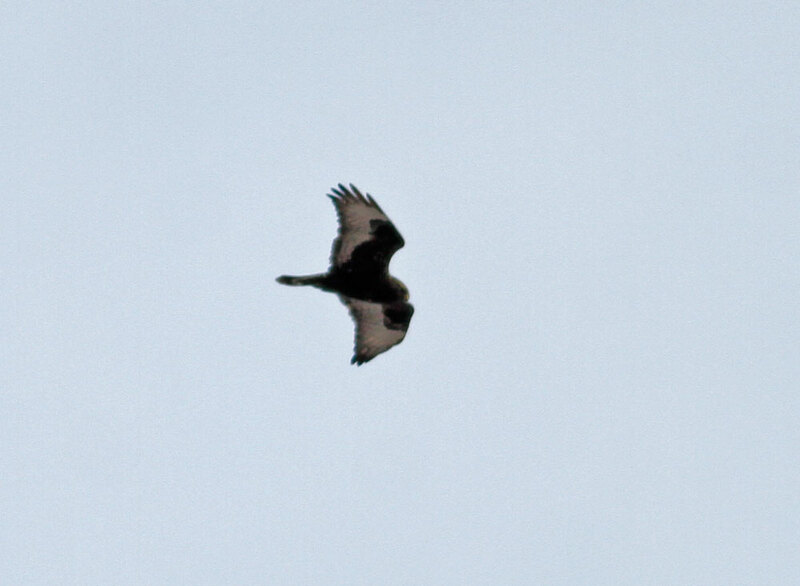 Within a few minutes a beautiful dark-morph Rough-leg cruised by and began hunting high over Moran WMA. It was the in the air for about an hour and even passed directly overhead at one point. 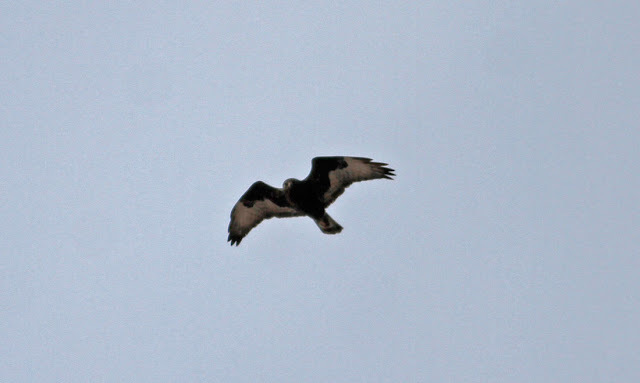 In between times, I watched up to seven Common Ravens together just playing and sparring on the wind and saw a sub-adult Bald Eagle pass through southbound. The most frustrating bird of the day was a Northern Shrike that 'teed-up' all too briefly beside the lower parking lot, whilst I was in the upper parking lot! I only managed a couple of atrociously distant shots but any day with a Northern Shrike is a good one IMHO. 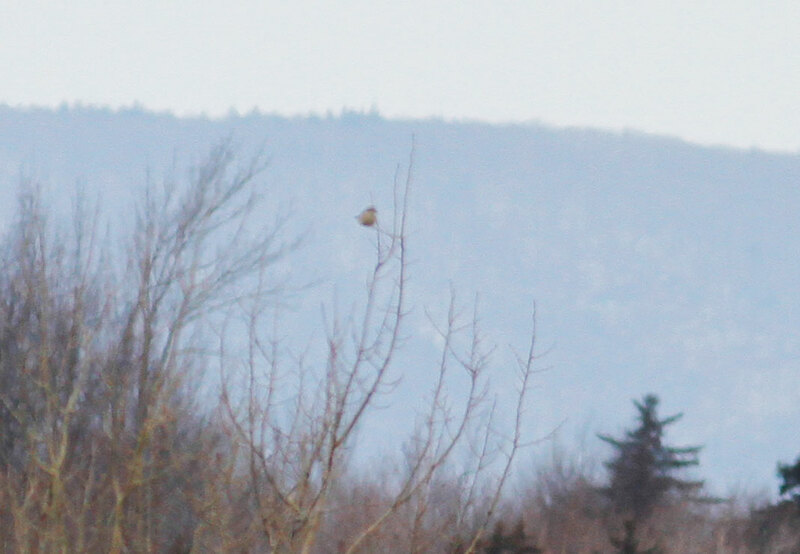 Northern Shrike - Moran WMA, Windsor, Berkshire Co., MA. January 12th, 2015. Teed-up for just a few seconds before I lost touch with it. Overall, I thoroughly enjoyed my visit to Eugene Moran WMA. With just 11 species over three hours of effort, it's relatively low on diversity in mid-winter but the quality is there. I'm ashamed to say it's about ten years since I last visited Moran but I'll certainly be back for another winter visit soon.